Regupol acoustic products significantly reduce impact sound levels within living and working environments and, for many years, Regupol underlays have represented the preferred choice for architects, project engineers and acoustic specialists. Every building has different noise parameters influenced by factors such as the Building Code of Australia, the specifying architect / developer, local council and strata by-laws etc. For this reason, Regupol offer an extensive range of acoustic underlay products to satisfy different scenarios. 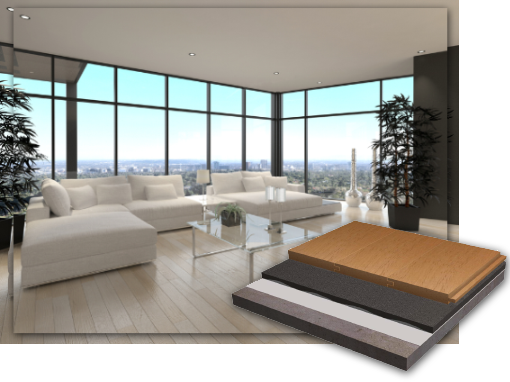 In addition to noise reduction benefits, Regupol underlays also enhance living and walking comfort while improving the resilience of the top floor. Each product has its own distinctive characteristics and each underlay is suitable for a variety of different applications. Available in thicknesses ranging from 3mm to 17mm. Please refer to each variety for details. The majority of Regupol underlays are available in roll or tile format, with a few exceptions. Please check the brochure for details. Regupol underlays can significantly reduce impact noise in a building as well as offering benefits of thermal insulation. Whether for a commercial or domestic application, Regupol underlays are easy to install. Regupol underlays offer a long service life and remain permanently elastic. The underlays also reduce premature wear to the top floor. Regupol underlays are manufactured from recycled materials and at the end of their service life, Regupol underlays can be 100% recycled. Regupol underlays are suitable for use with underfloor heating systems and also enhance the walking and living comfort of a building’s interior. Regupol Acoustic Underlays have undergone field and lab testing, with each system meeting relevant flooring and building standards for tiled floors, resilient floors, screed floors + timber flooring. During the design process, acoustic engineers require laboratory results to show confidence and assurance that the flooring system will work. Currently in Australia, there is an abundance of test results for walls, but very little for floors. Regupol® (Australia) Pty Ltd have taken the initiative to test their Acoustic Underlays in the laboratory. The tests have demonstrated conformity with the Building Code of Australia (BCA). Different types of underlay, with different floor surfaces and various thicknesses were tested. The tests were conducted in the CSIRO laboratories at Highett Victoria. The BCA requires a minimum performance rating of Ln,w < 62. This rating is a measure of the flooring system’s ability to supress footfall and noise and from other impacts. The lower this rating, the higher the impact sound reduction performance of the system. A building solution will comply with the BCA if it satisfies the performance requirements. Regupol provides a building solution which satisfies the performance requirement of Ln,w < 62. L’n,W – Weighted Normalised Impact Sound Pressure Level. ii) a sole occupancy unit from a plant room, lift shaft, stairway, public corridor, public lobby or the like, or parts of different classification. Recycled materials and products such as Regupol, can play a major role in the design & construction of environmentally friendly & sustainable buildings. To ensure this, we have had many of the Regupol Impact Sound Underlays GECA Certified for their environmental contribution. The independent verification performed by GECA shows that the acoustic range of Regupol recycled products are environmentally preferable and meet the requirements of GECA 25-2011 v2 – Floor Coverings Standard. Additionally, the GECA 25-2011 v2 Floor Covering is recognised by the Green Building Council of Australia (GBCA) under their assessment framework for product certification schemes. The selected Regupol products will provide a Level A sustainability factor weighting (100%) within the Green Star Sustainable Products Calculator. In the past 40 years, the volume of processed, shredded post-consumer tyre waste used in Regupol Products has exceeded 2 million cubic tonnes. Everroll flooring provides the perfect anti-slip surface for cyclists, making it ideal for this ramp leading to EOT facilities at Woodside. View the installation of FX50 pavers in a designated weight-lifting area within a popular Perth Gym. Brian has performed installations on behalf of ABS West for over ten years and deals with gym, equine, commercial and marine installations. Impact sound transference between adjoining properties can seriously affect enjoyment levels. To counteract this problem …..